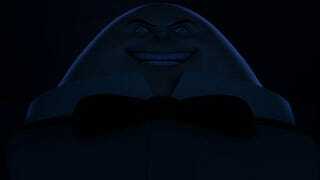 Humpty Dumpty was a big freak, Humpty Dumpty began to speak. "I'll swallow your soul, and I'll swallow it whole", So I pushed the freak off the wall breaking him into a bajillium pieces. See? Humpty Dumpty was pushed! Have you ever thought about the crap we tell kids? I've done posts on the creepiness of fairy tales before. And I believe I've mentioned nursery rhymes, too. But I can't tell you about Humpty Dumpty today. I was going to tell this story yesterday, but life intervened. So I was going to tell it today. But I can't. And why can't I? Because it's Totally Trippy Theory Thursday! Now, if I remember correctly, last weeks Totally Trippy Theory was about how Jesus invented the internet. And I also promised that todays theory would make last weeks look downright normal. So, here goes. I'm just going to come out and say it. I don't like keeping people in suspense. I figure that if I just come out with the theory, you'll all be so flabbergasted that you won't have the words to describe how flabbergasted you are. Because this is flabbergasting. And, as always, I'm not making this up. This is a real theory, believed by some people, somewhere. Hey, did anyone else watch 'It's The Great Pumpkin Charlie Brown' last night? Boy...I haven't seen that in years. Like I was saying, I don't like keeping people in suspense, so I'm just going to come out and tell you all the theory right away. Well, as the theory goes, the flood of the bible was not a myth. It actually happened. And the reason there is no evidence of it on Earth is: the flood took place on Mars. Noah, as it turns out, was the leader of Mars. And Mars was about to flood. The whole dang planet! So noah gathered up his family, friends, and specimens of all the creatures from Mars, and they got on their 'ark', which was a Ginormous spaceship. They flew the ship to Earth, disembarked, and that's how the Earth became inhabited. It makes perfect sense! It explains why there's no evidence of any early biblical stories on Earth! They all took place on Mars! Also, it ties christianity into another of the mainstream religions. After all, isn't that basically the same story as Xenu? You know, the alien guy from Scientology? And Adam and Eve? They still get the credit for being the first people. They were the first ones out of Noahs spaceship. I'm telling you, if I could, I would write this up into a neat story and sell it on Amazon. But I can't. Someone else already did. I'm not going to recommend you buy and read the book, but if you're at all interested in the story of how Noah came from Mars, you may want to check it out. It goes into way more detail that I did. I couldn't go into more detail. I would have started laughing so hard, I never would have finished this post. So anyway....it's unfortunate that there are people who believe this. While I firmly believe people are entitled to believe what they want, some beliefs just make you want to smack people upside the head. But, on the positive side of things, you know tomorrow I'm going to be telling you about Humpty Dumpty and his fall.